*First lady Michelle Obama will return to Los Angeles for yet another star-studded fundraiser — this one hosted by Will Smith and wife Jada Pinkett Smith on Oct. 25 at their home in Calabasas. Other co-hosts include Salma Hayek, Roc Nation co-founder Jay Brown and wife Kawanna, film producer James Lassiter and wife Mai, and Lady Gaga manager Troy Carter and wife Rebecca. According to link on Obama’s campaign website, a $2,500-per-person contribution to the Obama Victory Fund gets you into the lunch, while a $10,000-per-couple donation is good for a photo with the first lady. For $40,000, you and your companion can lunch, pose for a photo with Michelle and take part in an exclusive “meet-and-greet” preceding the meal. 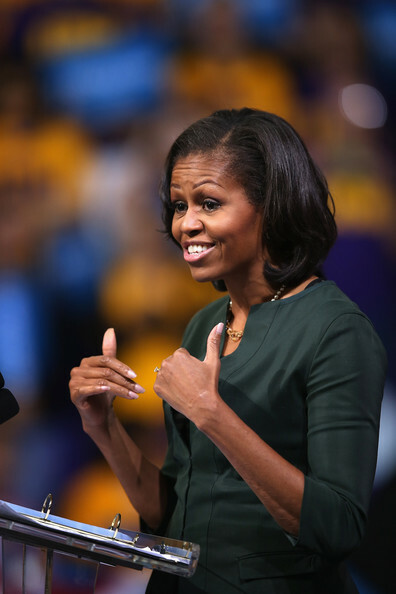 On Oct. 26, Michelle Obama will travel to La Jolla for a fundraiser hosted by Irwin Jacobs, the billionaire co-founder of Qualcomm, and his wife Joan. The luncheon announcement, sent out by members of the president’s finance committee on Friday, comes just days after President Obama made a sweep through Los Angeles for three events, including a concert headlined by Katy Perry and Stevie Wonder at the Nokia Theatre. Former President Bill Clinton also hosted a fundraiser for the president at Oprah show mogul Michael King’s house. According to sources, this week’s fundraisers raised more than $10 million for the campaign, after online contest proceeds (to meet both Obama and Clinton on the campaign trail) were factored into the total. It’s too bad almost no one on the federal level has the balls to do the right thing to save our democracy. Obama will raise record cash again and the Dems will look the other way. People tend to lose their principals when their guy is winning. This country is going to hades in a handbasket. Am I the only one who thinks Gabrielle Douglas looks a little like Mrs. Obama?